If you’re looking for the perfect recipe for a cornflake tart, look no further, I’ve got your back. 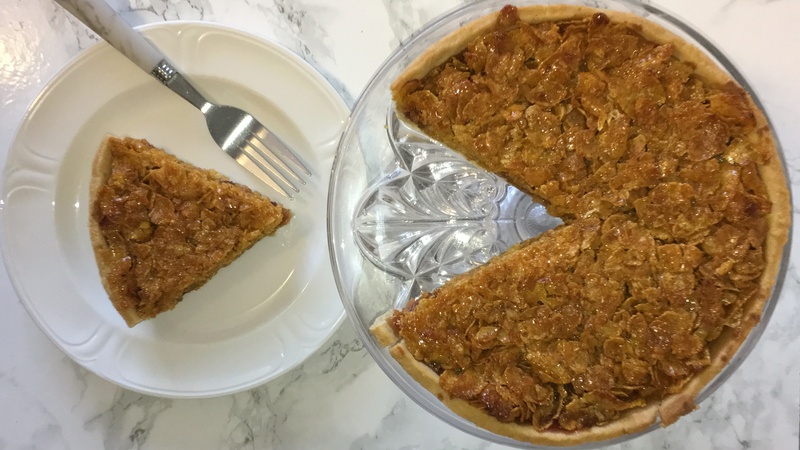 This recipe is my take on the traditional version of a cornflake tart, it’s a really quick, easy and cheap recipe to make and will go down well with many who get to try it. If you’re not sure what a cornflake tart is, I’ll give you a quick run down of what exactly it is. It’s a pastry case which is topped with jam (I opted for strawberry, which is what i remember but feel free to use any berry jam) and then topped with cornflakes that have a sugary sweet syrup stirred throughout them. So, it’s 3 simple layers of shortcrust pastry, jam and sweetened cornflakes, you might even have the stuff in to make it! If you haven’t made your own pastry before, don’t worry. I have a great recipe for my own shortcrust pastry that I use for all of my pie and tart crusts, it’s yet to fail me! Don’t be intimidated by the thought of making pastry, it’s simpler than you’d think. Here is a link to my recipe, it’s got all the information you need to know, along with tips and tricks on how to make this turn out perfect for you each and every time! Once you’ve made your pastry and allowed it to chill in the fridge, you’ll want to take roughly about half of it and roll it out until it’s about an inch bigger than the tin you’re using, I opted for a disposable 6 inch/15cm tray but feel free to use whatever you have. Once the pastry is rolled out, I then place it in the tray and press it down so it’s in place and then trim away the excess from around the edge, then dock the bottom of the pastry using a fork, this is just to stop the pastry from having air pockets while baking. The final stage before we bake this is to place it in the fridge for around 1 hour, then bake it off at the required temperature. *I only chilled mine for a short period, so the longer you chill it for, the less it will shrink*. While your pastry case is baking in the oven, it’s best to make the filling. Place the all the ingredients (except for the cornflakes and jam) into a small saucepan and melt them together over a medium heat, stirring well. Once it’s all melted and well combined, the mixture will be a deep orange colour. Pour this mixture over your cornflakes and stir the two together until they are well coat, it doesn’t take very long at all. Once the pastry case is out the oven, spread a good amount of your jam on top of it, then spoon on your cornflake mixture. I like to add mine gradually so I don’t make a mess, but feel free to do it your own way. once you’ve added all the cornflakes on top of the jam, I like to gently push them down a little, so its more compact. Pop this back in the oven for a few more minutes, just so the cornflakes become more golden brown, remove from the oven and allow to cool completely before enjoying. 100-150g Jam (I used strawberry but feel free to use any red berry jam). Make your pastry (using my recipe, if you’d like) and allow that to chill in the fridge for 1 hour before use. After 1 hour, roll out half of the pastry, just until its about 1 inch/2.5cm bigger than the 6 inch tin/tray you’re using. Press down the pastry into the tin and trim away the excess from the sides. (If your pastry has ripped or torn, fix it at this stage). Dock the bottom of the pastry, using a fork. This prevents pockets of air forming while the pastry is baking. Chill in the fridge for around an hour, then bake in your preheated oven at 200˚c/400˚f for 15-20 minutes. 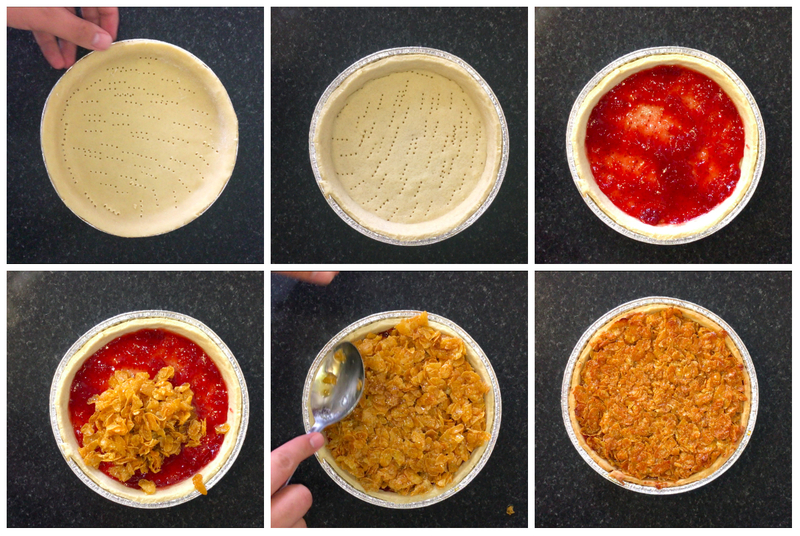 While the pastry is baking, make your cornflake filling. Place the golden syrup, butter, granulated sugar, demerara sugar and a pinch of salt into a small saucepan and place that over a medium heat until everything has melted and come together, stirring well. Remove the liquid mix from the heat and pour over the cornflakes, stirring well until the cornflakes are all well coated in the syrup mixture. Once the pastry case has been removed from the oven, spread over a generous amount of jam (I opted for strawberry but feel free to use your preferred flavour) and then spoon on your cornflake mix, pressing it down slightly once all the mix is in the case. Place back in the oven for a following 5-7 minutes (or until the cornflakes are starting to turn a golden brown colour). Allow to cool completely before you enjoy it, to serve enjoy it on its own or with custard, cream or ice cream.